Study the Book of Revelation for it is "The Revelation of Jesus Christ ..." (Rev 1:1). It is both a revelation from Jesus and about Jesus. It tells of His central role in the salvation of His people and His vindication of the character of God and in it He tells of the events coming upon this earth in the near future as the process of salvation is brought to completion. This series of pages will include notes from research and insights shared during a weekly, in-depth study of the book of Revelation. If your desire is to study the book of Revelation and understand its messages, you will find the information linked to here a great help. There is both simple information - think of it as Revelation for Dummies - and pages dealing with topics in considerable depth. In some cases, alternative viewpoints will be presented and I will try to not be too dogmatic on such items as whether the 144,000 of chapter 7 is referring to a literal or figurative number. No claim is made that the information on these pages is 100% correct. We are all advancing in our understanding of Bible truth. You are urged to study for yourself and to diligently compare scripture with scripture. Each entry below will become a link when the page is completed (and many related pages will be added) - this may take a year or more. We are just finishing our study of chapter 6 and the earlier pages need to be edited and loaded. Check back to see when there are more pages completed or subscribe to my monthly Prophecy Newsletters to be notified of new pages and prophecy updates. There will be a page or more for each chapter and additional pages of information related to topics in Revelation. Studies may contain links to other pages with further information. Revelation 5 - who is worthy? 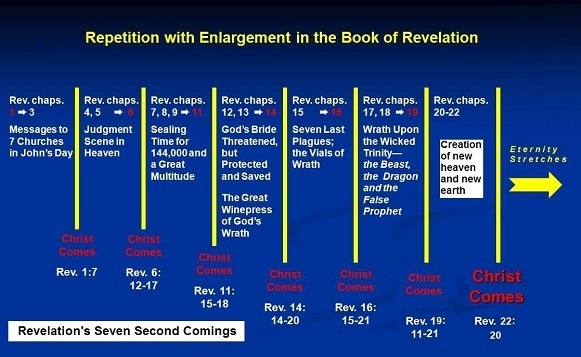 You can also download a larger version of this diagram as a PDF file: Revelation's Second Comings diagram, 207 kb instant download. You will need Adobe Reader to download the diagram (a new window will open so you can download it without leaving this page).